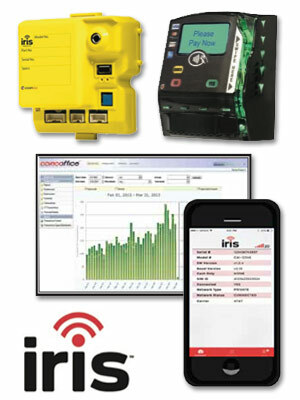 Coinco’s iris telemetry and cashless devices offer industry leading features and innovative technologies specifically designed to maximize your profits in today’s vending environment. Enables your machine to accept cashless payments by connecting them to the secure network. 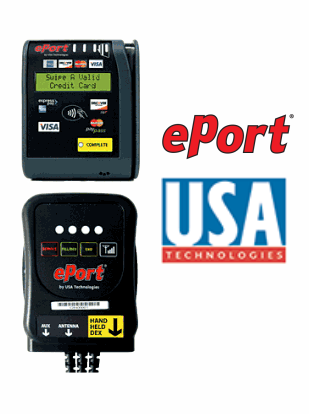 Communicates via Ethernet, USB, bluetooth and WiFi to meet specific location requirements. Provides 24/7 remote data monitoring to take the guesswork out of inventory and restocking. Interfaces with most backend Route Management Systems via the NAMA VDI industry standard. Installs in seconds with a unique magnetic mounting system. Card Readers accept cash, credit, debit, coupons, mobile wallets and campus cards, giving customers more ways to pay and more incentive to purchase. 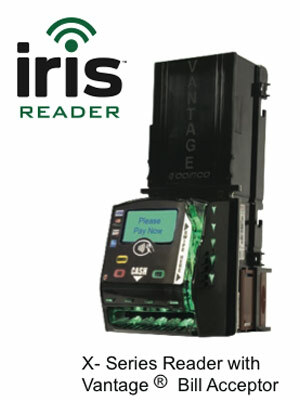 The iris system is PCI compliant, ensuring your transactions are safe and secure. Free, secure app for your smartphone that gives you the ability to review the health of your cashless and telemetry data system via bluetooth without even opening the machine. No data connection required! The iris Mobile app uploads errors to your smartphone so you can be sure the equipment is working before you leave. 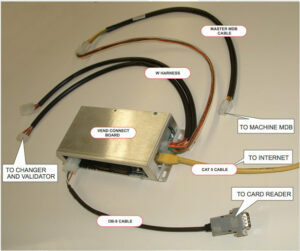 Crane's Navigator telemetry device is the heart of the Get Connected program, providing the online connectivity required. 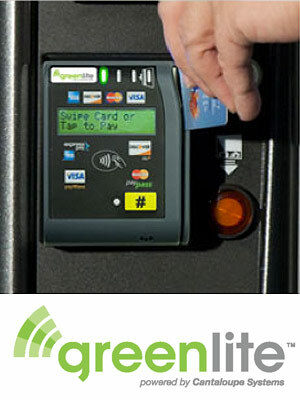 It is integrated into every Media machine at no additional cost, as is the Currenza credit-card swipe. Navigator enables cellular airtime, cashless transaction capabilities, remote DEX delivery, MDB and over-the-air alerts, improved accuracy in prekitting and dynamic scheduling and over-the-air updates. Navigator also allows for modular upgrades, swap-outs and feature additions in the future, such as other touchscreen devices, cameras and new cashless bezels. 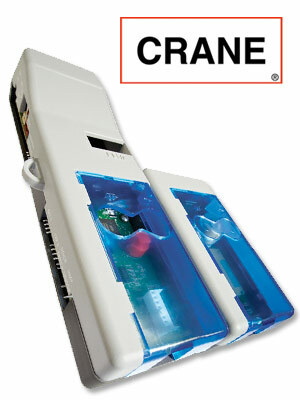 Crane Navigator, vending machine telemeter The telemetry device's memory offers large storage capacity for future needs like video content, product images and nutritional information. It also gives the operator the choice of cellular carrier. The same systems that power Navigator drive all Media's online features, including cashless transactions, remote machine management, nutritional content display, near-real-time data transfer to VendMax or other vending management systems, and real-time alerts. VendNovation provides future-proof software and hardware to meet the needs of the modern vending industry. We work hard to produce affordable, easy to use software and hardware that will help you save money. 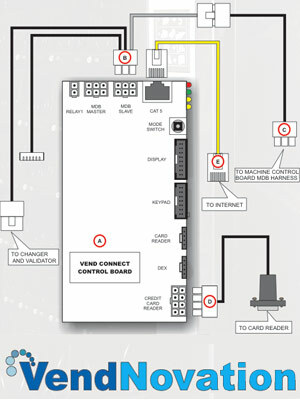 The heart of the VendNovation system is a custom vending machine control board that works in a variety of machines and has many modern features. Each controller board has an RJ45 Network connection port that allows the vending machines to talk directly to VendNovation's hosted software or Point-of-Sale systems that have used our Software Development Kit. Each board also supports DEX, Credit Card hardware, keypads, various card readers (RFID, Magnetic Stripe, Barcode), biometric devices, and many other custom extensions. For customers who don't want to replace their current machine control board but still want updated functionality (Credit Card processing, Dex Support), VendNovation provides a MDB Bus connected device with much of the same functionality as our custom controller. VendNovation provides a hosted, web based software system that gives you real time access to the operation of your vending machines. All you need to access your vending machine data is an active internet connection and a modern web browser. You get 24/7 access to your data anywhere you have access to the internet. See current machine status, hardware alerts, earnings information (by machine, product, route, or account). Pre-pick product to service machines, schedule machines for service, view interactive reports and more in real time.